You might not actually be able to do everything you put your mind to like you've been told, but now you can tell a turtle to move to the left or right. While many of us have a hard time getting our bodies to obey our thoughts (I get it – waking up is hard), science has found a way to use them to control animals. The smart folks at the Korea Advanced Institute of Science and Technology (KAIST) have come up with a human-to-turtle interaction system that reads brain signals to relay information directly between man and beast. It won’t quite give you Master Splinter levels of command over turtles, but you will be able to dictate the direction in which they move. Turtles were not picked to be part of the experiment by spinning a wheel or asking a kid to name an animal. They were in fact singled out for the possession of certain peculiar qualities that make them perfect for such an undertaking. For starters, turtles have a level of cognitive capability that can handle the demands of human thought control. They are also able to tell between different wavelengths of light. That’s important because they use the ability to move towards white light (light containing all visible spectrum wavelengths at equal intensity) in a predictable manner. That instinct was essential to the design of the interface, as we’ll find out in a bit. So here’s how the setup looks. The human wears a head-mounted display (HMD) which is connected to a brain-computer interface (BCI). This interface is used to obtain commands directly from the human brain to a computer. The turtle is then fitted with a simulation device, which includes a Wi-Fi transceiver, camera, battery, control module (a Raspberry Pi), and a semi-cylinder that turns 36 degrees in either direction. The semi-cylinder has a slit that is aligned with the turtle’s eyes when in its normal position, so it can see what’s in front of it. The human sees a feed of the turtle’s point-of-view in the HMD. Once they can see its environment, the human decides which way the turtle should move. Three commands are recognized: move left, move right, and remain idle (as in, keep being a turtle). 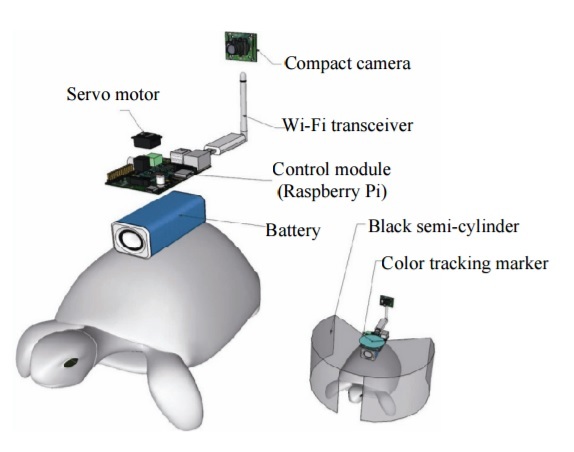 If the decision involves moving either left or right, the BCI conveys it to the turtle’s simulation device via the WiFi transceiver. Now say the human wants the turtle to move to the left. The BCI tells the simulation device that, so it rotates the semi-cylinder towards the left. As a result, the slit in the semi-cylinder is off to the left now. This makes the turtle turn to the left because its natural instinct is to move towards white light, which is streaming in through the slit on the left. So as you’ve probably figured out by now, what the human is actually controlling with their thoughts is the semi-cylinder mounted on the turtle–not the animal itself. The turtle is just doing turtle things moving towards the light. Sorry to burst that bubble. Even if it isn’t actual telepathic mind control like you were hoping it would be, you must admit the technology is incredibly cool. It has also got real-world applications. Some day, we could use the same technique to create devices controlled directly by the brain to carry out surveillance and recon missions without putting human lives at risk. Although the researchers didn’t suggest it, we could also use the technology to conduct competitions in which human-turtle pairs traverse obstacle courses. Like a mind control version of the Westminster Dog Agility Contest. But with turtles. Come at me, PETA.